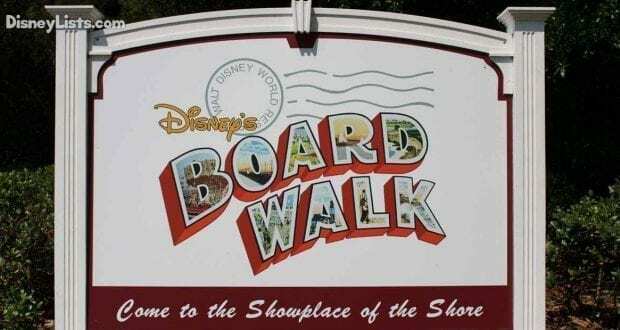 8 – The proximity to Disney’s Boardwalk. Disney’s Boardwalk is loaded with shopping, dining, entertainment and more. It is designed like a boardwalk that you would see in Northeast United States, and it is a gorgeous area. It is a great place for adults and kids to hang out and enjoy when you need a break from the theme parks. The best part is that it is walking distance from the resort. This gives guests lots of dining options to choose from without having to go very far from the resort. This can help to save time, too. The Boardwalk theme is gorgeous and a lot of fun. 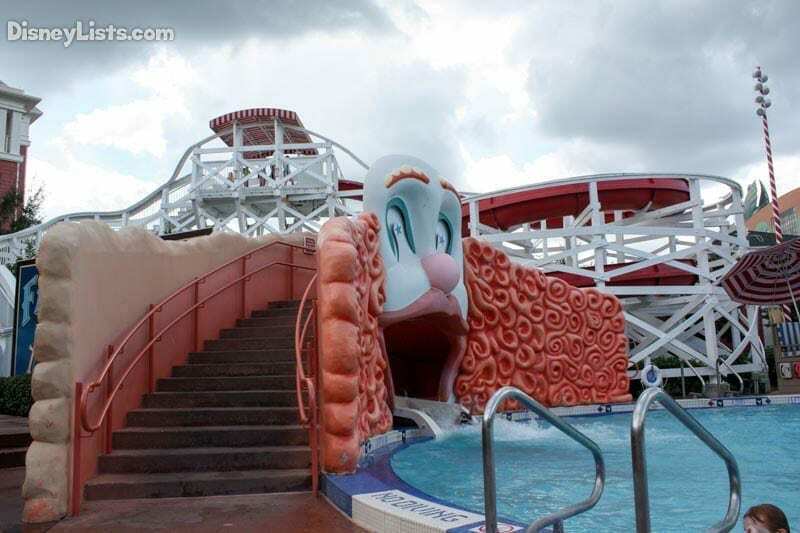 The pool area looks like a fair, complete with a waterslide that has you exit right through a huge clown mouth. It is really unlike anything you would expect to see at Walt Disney World, which is part of what makes it so unique and fun. With all of the activity you would think the resort would be bustling and constantly crowded, but I actually find this resort to be peaceful, respectively. We love the laid-back feel of the resort and the theme. The Boardwalk area is home to some of the best Disney nightlife. There is a sports club, a piano bar, a dance club and various dining and lounges. If you are able to get away from the kids for the evening or are traveling without kids, then this is definitely the place that you want to spend your evenings. No driving or waiting for transportation. It’s just a short walk to all of the action and makes for a great evening. 5 – The proximity to theme parks. The resort is actually extremely close to Disney’s Hollywood Studios and Epcot. You can even walk to both of the theme parks from the resort. If this doesn’t sound appealing because of all the walking you will do at the parks, then you can also take advantage of the boat transportation. The boats pick up at the Boardwalk and go to both theme parks. At Epcot the boat drops off at the World Showcase entrance. If you plan to eat and drink in the World Showcase, this entrance is great. 4 – The deluxe accommodations. The resort is in the deluxe resort category. This means that the resort has additional amenities and services including higher quality bedding and linens, table-service restaurants, better room service selections and more. The entrances to the rooms are inside the resort instead of the doors on the outside like a true hotel, and resorts have balconies that overlook various gorgeous views. The service is impeccable. Once you stay at a resort like this, you will only want to stay deluxe. 3 – Amazing recreational activities. This is the location to rent a surrey bike. 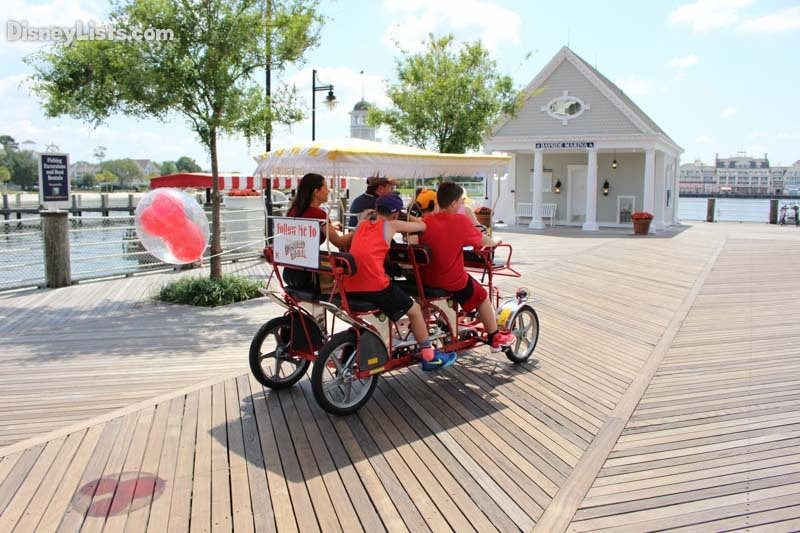 You can take you family for a ride around the resort and boardwalk area with a surrey bike. You can also rent a regular bike, too, if you rather. You can also go fishing, rent a boat and boating equipment, enjoy the gorgeous pools, etc. This is all right there at the resort and boardwalk. There are so many great activities that it will be hard to fit them all in on a short trip, so you will definitely want to stay longer. 2 – View of the fireworks. From the resort you can actually see the fireworks at Disney’s Hollywood Studios and at Epcot. Many times fireworks shows are performed at both parks in the same night, so you have multiple opportunities. The views are beautiful and it’s a huge perk to the location since you can enjoy the view on a date night or at the end of the evening with the kiddos without being inside the crowded parks. 1 – The club level accommodation options. The resort offers club level accommodations for an added cost. With club level you have access to a club level lounge that is stocked with food and beverages (including alcoholic beverages). You also get itinerary planning services where you can have all of your dining reservations, recreation activities, golf times, spa services, etc. booked for you so that you don’t have to go through the hassle yourself. You also get a nightly turndown service and treats left in your room. When you arrive there is also a special check-in area for club level guests so that you can check in quicker and easier. It is one of the best stays that you can have.